The first thing most people think of when thinking About Planet of the Apes is Charlton Heston’s celebrated overacting as Taylor saying, “Take your stinking paws off me, you damn dirty ape!”, but after reading this entertaining and thought-provoking book, Planet of the Apes and Philosophy: Great Apes Think Alike (edited by John Huss), part of the Popular Culture and Philosophy series from Open Court, I realize that either I don’t think enough about Planet of the Apes…or these philosophers think about it way too much. 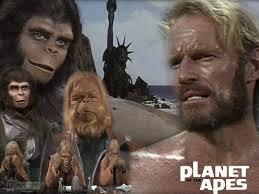 While I enjoyed all these cool essays on how Planet of the Apes pertains to: war, peace, love, hate, prejudice, revolution, evolution, genetic engineering, time/space paradoxes, insanity, identity, the environment, our inability to learn from the past, not looking toward the future, what made me think most was about our ability as humans to speak. Humans talk. We talk a lot. We talk about important things. And a lot about trivial things. We tell truths, lies, we tell people what they want to hear and sometimes we tell them only what we think they need to know. We feel our being able to speak separates us from animals, somehow makes us a superior species. This book is an absorbing and straightforward work that lets us explore many ethical, political, scientific, cultural, creative, and emotional issues in the fun and safe environment of the Planet of the Apes franchise. It makes one think, is our new frenzied behaviour because we jumped into technology that instead of amplifying our voices in fact mutes them? The information age was supposed to enlighten, it was supposed to be the great equalizer. Yet we are bombarded by that information, it comes at us in waves, in 140 characters, in memes, emails, texts, posts, pictures, videos, social media…and there’s no need for that information to be correct, just out there. 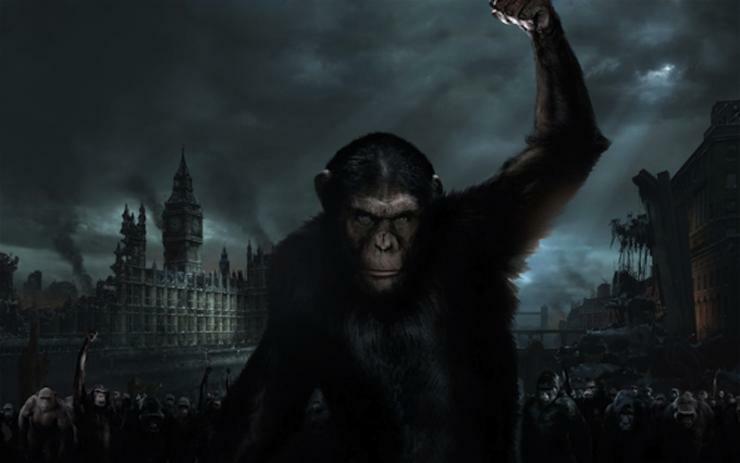 Whatever it is, we can’t seem to stop…the movie Dawn of the Planet of the Apes, the latest in the franchise (the 8th plus 2 TV series) will be hitting theaters July 11, 2014. Maybe we should try to work out our problems here on Earth without struggling too hard to solve the mysteries of mankind and the universe, after all, we might not like the answers. Next Post Happy Birthday Paddington Bear! And yes, I’m ready for the new movie! I’m reblogging this thoughtful article,not only for its content about the film, but also for the comment about our hasty technology that resonates with many of your comments on m blog about today’s technology. Thank you so much for the reblog. Very true, we’re rushing forward without looking at the long-term consequences, another case of just because we can doesn’t mean we should. I’m glad that The English Professor re-blogged this thought provoking post. Thank you both. Yup, we’re so overloaded with information it’s good to get back to basics. The monkey cage at the zoo has usually been a big draw, perhaps because the monkeys tempt us to see ourselves … A lot of sci fi movies seem less thoughtful than the original book, in deference one supposes, toward visual action. But a decent director will install the thought where he can, I should think. “Planet of the Apes” struck me as a shot at using a circus for displaying us … a hairy dystopia.More there than initially obvious.